Deep Dive - Static Context in Visualforce Apex Controllers ! Apex static is always confusing for me, I am from Java background, so it took a while for me to really understand differences between Apex vs Java static. This post discusses apex controller static behavior, i.e. in relation to Visualforce only. Here by Apex Controller static, I mean static variables/blocks declared in controller associated with a Visualforce page. The Apex STATIC context – Variables & Code initialization blocks ! Apex VF Controller Static – Common MYTHs ! Developers, specially from Java background assume, that static variables once initialized on first class load, can be shared/updated across multiple HTTP requests. This typically goes with Java classes. But this is not true at all with Apex, never expect to set some value in Apex static variable and expect it back in next request, even next Ajax request. On every new request, you will find static variables re-initialized to the value declared or updated in static blocks. Then, what is STATIC in Apex Controller ? – Real Story ! In general as per Salesforce docs, this is definition of static. JVM(Java Virtual Machine) usually don’t reload classes. A Java class is loaded once in memory usually stays till container is UP. Same stands true with static variables in Java too, all information kept in static context is available through out the application across different user sessions etc. J2EE & Frameworks like Struts, create a Session per user login like Salesforce. But that session is available to multiple requests via Cookies etc and acts as good mini container to store logged in user specific information. But these both Java approaches are memory hogs and not scalable to multiple users, that’s why J2EE containers have complex session and other clustering mechanisms to scale for huge enterprise apps. So, having static in this manner is important for success of multitenant nature of force.com platform. As force.com is multitenant, multiple customer orgs, with multiple users share the same hardware resources like CPU, RAM(Memory). If Apex static was like Java, then I can’t imagine how much memory would be required by force.com servers to match the current load. I am sure, they can’t scale ! So, are Static variables good for anything in Apex Controllers ? As, static variables are not part of view state. One can consider static as “C” language CONST, use them to declare constants in Apex. In my next post, I will discuss Apex static context in Triggers. Would love to discuss your ideas/views on Apex Controller static context, please comment !! Why I can only follow/subscribe to 500 entities with Chatter ? Chatter makes enterprise communication easy for sure. People can chat around standard/custom objects, share files/links, follow people and even objects etc etc. All is pretty good with Chatter, except the limitation of maximum 500 Entity Subscriptions per User. The strange 500 limit ? One User can only follow at max 500 objects or people or files(from winter’11). This is a weird limit, we came across this limit within a month after starting with chatter. Reaching 500 mark by manual following (hitting follow button) will take some more time, we are using triggers to do rule based auto following. But its pretty common to have some auto-follow triggers setup in chatter enabled orgs, these triggers make some users follow some interesting information based on biz rules. In such auto-follow scenario, I am sure one will face this error pretty quickly. Why this 500 limit hurts ? If one has auto-follow rules/triggers setup, once this limit is reached, can block the transactions, as triggers will fail for this error. The only quick solution left in such cases is to disable any such auto-follow trigger. This requires Admin access too, so not a straight task to do for a normal non-admin user. In my case because of this error, we have to devise another biz rule to un-follow some of the old data(that might be still important), based on time frame window etc and some certain record state. A standard example can be auto un-follow Opps that are Won/Closed, though such Opps can carry some interesting chatter conversations. Chatter is Enterprise Facebook/Twitter for me. From our Facebook/Twitter habits, we all are too much in habit of following, this is what we do always in Twitter OR Facebook (like/groups). We never have think the follow/like count before following any new interesting information source. Chatter unfortunately kills here, one can’t fly free or plan some cool auto-follow biz logic based on this “500” constraint. Idea-Exchange – Remove this 500 limit – VOTE !! I posted my pain on force.com forum here, but should have posted an idea too in parallel. Never mind, some wise person already did that, here is link to the idea. We all love Chatter, so please vote to get rid of this 500 limit ! This idea desperately needs votes. 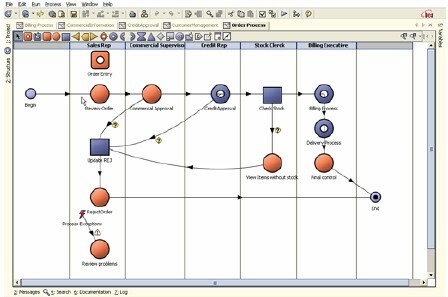 Salesforce Winter'11 Visual Process Manager - Flows ! This post covers new Winter'11 stuff called "Visual Process Manager—Pilot", this feature seems super powerful, but somehow less discussed and marketed as of now. This might be because its just a pilot release ? Ability to query Salesforce.com data, without any coding. Ability to branch based on user data or input. Plus ability to execute logic. Not clearly described, but hopefully this will allow Apex execution. So with all these capablities in place, it seems easy for business analysts and admins to develop a "dynamic" application, without writing any code. What to expect Visual Process Manager ? Though no screenshots, details etc for Visual Process Manager are available in winter'11 release notes etc. 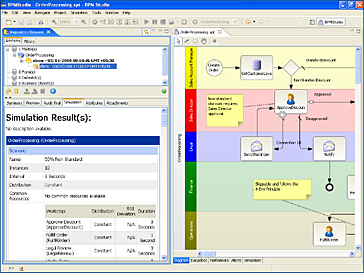 But as it will be a BPM(Business Process Manager) application, we can expect something similar done by guys like BEA(Aqua Logic) or Savvion BPM Studio. These both applications give somehow the same abilities to develop biz flows on respective platforms. Developing flow is just like working in a paint brush application and drawing a flow chart. Here are few screen shots. Though its too early to guess, what force.com is coming with Visual process manager. But applications not involving complex interface should be easy to develop. Though if flows, opens ability to plugin visualforce pages, just like ability to execute logic later on. Then complex interfaces should be easily possible. Visual Process Manager will for sure help Business Analysts and Admins to quickly develop applications on force.com platform. On the other hand it might also hurt freelance apex/visualforce developers, as number of salesforce jobs for trivial or simple force.com screens will be for sure reduced. Still too early to conclude more, let see what comes up. Visual process manager is not available by default, one has to request salesforce to enable it in their org. Working with Aggregate SOQL queries/results in Batch Apex ! What if you want create Batch Apex Job, that uses SOQL having aggregate functions like SUM, MAX, COUNT on top of results grouped by “GROUP BY” clause. You can’t easily create a Batch job via QueryLocator, as shown below. So the other option that seems doable is using SObject as generic type argument in Batchable, as shown below with complete source code. Here is the code sample for this. Database.Batchable implementations depending on Iterable<?> for data source are bound to normal governor limits, so Iterable’s can never process 50 million records like QueryLocator. Before using Iterable, you need to watch the amount of Data/Rows resulting from that Aggregated SOQL. Code Snippet: Full Batch class with all Iterable/Iterator implementations. Deep dive into Visualforce <apex:actionregion /> tag ! <apex:actionRegion /> is interesting and somewhat ignored tag in Visualforce. Tag is ignored, because Visualforce documentation is not in depth, to explain the real utility of this tag. So this post explains some stuff around action region to make it easy for developers to understand. Special thanks to @RajendraOgra for sharing his findings and information around this tag with me. What is Region aka ActionRegion ? The <apex:actionRegion> component specifies the components to be processed on Force.com server. If no <apex:actionRegion> is defined the whole View functions as a region. Here components means, all visualforce tags like inputField, inputText, outputPanels etc. conversion : converting from user inputted strings to date, numbers etc. model update : updating apex bindings i.e. Controller variables binded to visualforce page merge fields. Note, even when using <apex:actionRegion/>, the whole Form is still submitted but only part taken into region will be processed. Here the complete form is submitted when request is generated by <apex:commandLink/> but only markup between <apex:actionRegion > and </apex:actionRegion> is processed on server. The regions could be nested. Server picks out and processes only the region, which contains the component that initiates the request. Here in above example, the external region is processed for link1 and the internal one is processed for link2. Now, we will go thru a simple visualforce code snippet to understand the dramatic effect of <apex:actionRegion /> tag on validations and model update. We are having a simple page, comprising of two input fields i.e. name and job. Job input field is a “required” text field on the page. Type the name. The outputText “outname” component should reappear after you. However, in the first case, this activity will be aborted because of the other field with required="true". You will see only the error message while the "Job" field is empty. After filling in something in Job field, you can see outputText getting updated on keypress in Name field. To fix this, we need to use actionRegion, as of now all the visualforce components in the page are getting processed when request is generated on keypress. So a validation error does not allow to process an ajax input(i.e. name’s keypress). If we simply demarcate the inputText “Name” with “ActionRegion” the problem will be solved, because then only this component will be processed by the force.com server. Here is the fixed code snippet and it works well, without even filling in any job details. Note we just added <apex:actionRegion /> around input text, thats it. Want to play and see this actionRegion’s stuff in action, here is the link to my public site vf page. You can play with both cases i.e. with / without action region on the same page. I started using http://snipplr.com/, great website for quickly sharing code snippets. Here are the links to the source code. I am researching on other interesting attribute available on <apex:actionRegion /> i.e. “renderRegionOnly”. To avoid having too much information in this blog post about action-region, I will come up with more details on this in another post. Batch Apex & First error: Attempt to de-reference a null object ! I stumbled upon a strange Batch Apex issue today. My batch job was going well in few SFDC orgs; after deploying the same to a new org it stopped working completely. I just see, “First error: Attempt to de-reference a null object” in debug and apex logs. After adding a lot of debug statements in both start() and execute() method, I found that “execute(Database.BatchableContext BC, List<Sobject> scope)” is never called after creating QueryLocator in start(). So, finally after searching on dev forums found this solution; it says don’t query NULL columns/fields in initial SOQL i.e. the soql string given to QueryLocator in start(). This really fixed my problem. Add null checks in SOQL, for fields that could go NULL for ex. X != null. This might not be possible, as this will for sure change the records returned from the SOQL. Don’t query the fields that could possibly be NULL in start() method, re-query those in “execute(Database.BatchableContext BC, List<Sobject> scope)” method. This should be safer, as execute() will always be working on smaller subset of records for ex. 200 records. I used the later option i.e. don’t query NULLABLE fields in start() & re-query those fields in execute() method, this fixed the problem ! Sorting Apex classes Sobject using apex-lang code share project ! You must be stuck up with Apex, when sorting is required on instances of user defined classes and pre-loaded Sobjects. Unfortunately standard Apex API just gives a method List.sort(), that just works with primitive data types. Apex governor just gives handful of script statements and limited stack depth for your biz logic. Bubble sort is never a preffered sorting algo, for performance reasons(complexity) and number of high iterations. We can’t do anything about governor, best would be to let developer focus on biz logic only and let sorting taken care of by some other lib, like apex-lang. In brief apex-lang is port of very popular Java “Apache common Lang” project to Apex. More details about apex-lang are available in my previous blog post and this google code project. apex-lang offers many Apex utility classes. One of them is ArrayUtils, it offers APIs to quick sort instances of SObject and Object(User defined types/classes). The sorting API is very similar to Java’s Collections.sort(list, comparator), where you can pass in a Comparator to compare fields of two instances for a Class. How to write create a Comparator ? Second, that sorts the words based on their length. NOTE : The above comparator implementations are good for user defined apex classes only. If you want to sort instances of SObject, then instead of implementing ObjectComparator, just implement ISObjectComparator. Everything else goes same. We need two different comparators here, because unlike java in Apex List<SObject> doesn’t gels well with List<Object>. How to sort using the Comparator ? or, ArrayUtils.qsort(List<Object> theList, ObjectComparator comparator, Boolean sortAsc), to sort descending too. or, ArrayUtils.qsort(List<Sobject> theList, ISObjectComparator comparator, Boolean sortAsc), to sort descending too. Note, we created WordComparator & WordSizeComparator classes above. We just instantiated it and passed it to ArrayUtils.qsort() api. How to implement Comparators for Date, Number and other primitives. apex-lang comes with a good sample Comparator called PrimitiveComparator, this class shows how to compare each primitive data type. I suggest using this class as a learning stand point, rather using it. Because this class is meant to be too generic and it does a lot of checks, instance of etc, so you might end up in giving too much share of your governor limits like script statements to it. Many other pre-build and example Comparator implementations available as apex classes in apex-lang project. For ex. DecimalRangeComparator, SelectOptionComparator, SObjectSortByNameComparator. You can use these as starting point to learn how to code different comparators. In case of any issues, feel free to comment on this post. I will for sure help you in writing the correct comparator. When apex-lang can kill you ? As we all know operations like sorting involve many iterations/recursions and comparisons. So its very likely, when sorting a big data set you end up hitting any of these governor limits. How much script statements and other governor limits quota is required to process rest of the business logic. How big will be the collection to sort via apex-lang. This is important because, the bigger the collection will be more will the governor limits used. So, based on above two points. Here is the basic rule for developer to best avoid breaking governor limits in production/UAT. Match the governor limits consumed by biz-logic to the sorting logic. If business logic is already consuming too governor quota like script lines + stack depth. Then one needs to limit the amount of data sorted using apex-lang (or pick some other alternate). Developer has to know, what can be the maximum collection size to be sorted. Based on this max count the biz logic should be executed, to see if we are any where close to breaking governor limits. To see how close you are into limits you can use Limits class provided by Apex standard library. It gives pretty handy methods like getScriptStatements(), that you can use before after costly calls as shown below. How did I benchmarked “apex-lang” with big real data set. Creating a big data set with real random words is pretty hard to achieve programmatically, unless you apply some randomization logic to generate it. For my benchmarking purposes. I did a simple trick, i.e. Copy the text of a blog post or article to some text editor. This will give you many random words, easily in thousands. Split those words on whitespace, to get a Apex String array of size equal to the number of words. I used that String array of words to create Instances of “Word” class explained above, and that big random collection was used on different sizes to bench mark apex-lang. Hope it helps. Because of all this governor nightmare, how cool would it be, if some of these super helpful apex-lang classes become part of Standard Apex API. So for this reason, I am posting this as an idea on Salesforce Idea Exchange. Why apex-lang for apex-developers ? APIs : To reverse, merge, subset, compare and most importantly SORT arrays. As with Apex List<Object> and Object can be used interchangeably, so the same class with go well with Apex List collection too. Views : I worked a little with the sorting api’s. I liked the convenience of Apex port done for Java’s Comparator. Script statements consumed in sorting big collections requires a little care, will cover the sorting API, in a separate blog post. APIs : On top of Apex e-mail api, had support for sending html/plain email with attachments too. APIs : To join and compare maps. Views : I was expecting much more here, like support for Map-Keys as UDT(User Defined Types) etc. PageUtils: A bunch of useful API’s, good stuff to get request params, set page messages and url redirects. APIs : For more precise control on how to generate randoms. Definitely offers flexibly APIs as compared to standard Apex Math.random(). APIs : To see if their are messages of a given severity etc. Views: Few more APIs could be their like, one for creating mock test users for System.runAs(), can be a good addition to this. Views : Developers beginnning with Apex, should read this class to know the mini java - reflection style support with Apex. APIs: Its too rich and would need time to carefully read this blog post from Richard. Views : Nice bunch of APIs for creating dynamic SOQL, and well documented in the blog post too. Excellent ! APIs : Interesting API’s to capitalize, reverse case etc etc the Strings. Other Util Classes like StringUtils, SystemUtils, UrlUtils, UserUtils, SetUtils, BooleanUtils, NumberUtils, also offer decent APIs on standard Apex primitive data types and other types like User. Can be handy on many occasions. Presence of Governor Limits : Because Apex always runs under control of notorious Governor. This governor just gives us small number of script statements to execute for ex. Trigger : 10,000, Test : 20,000, Anonymous Block,Visualforce Controller, or WSDL Method : 200,000. So under these small limits, it becomes risky specially if your biz logic is already on edge of these limits. Even one can easily reach these and other limits(stack depth etc) while working on big collections. Loading of many Apex classes: As coming from Java background, I was habitual of following too many design patterns and creating many different Apex class files for Utility, Factory and many other relevant stuff. But sometime back I came to know that “Loading new Apex class is a big performance penalty, it triggers some validation code to ensure that dependent classes etc are valid”. So this becomes a big penalty when creating frameworks like this, its hard to keep number of Apex classes to minimal. Solution to this is “to create many related nested/inner classes inside a big Apex class file”. Apex code limits: Though this is not a big reason, but as these frameworks are normal Apex classes, they share your org code limits. If you are working on big Salesforce projects, you can already be on or close to border of this limit. This salesforce community link is good example of this.